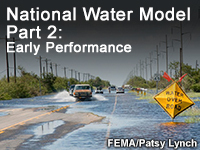 In this lesson the learner will review and interpret data regarding the early performance of the National Water Model (versions 1.0 -1.2). Verification and evaluation of the National Water Model has been occurring since it went operational in August 2016. This lesson will review some of the main issues in model performance through early 2018, including some retrospective verification extending back to 2011. You will see how model performance has been improved as a result of verification. Among the topics addressed are peak flow timing errors, model bias and correlation, the impacts of basin calibration, inclusion of reservoirs, snowpack evolution, drainage in sandy soils, Quantitative Precipitation Forecasts (QPF), and time-lagged ensembles. Have an account? Sign In to write a review. Error: Username is not set. Please go to Your Account page and enter a Username in the "Create a Username" text field. This lesson is applicable to an operational forecaster. Not a bad introduction, but more sophisticated media would be good. very good. this lesson helped me to understand some of what river forecasting dose and uses. Great overview of the National Water Model. You must be a registered user in order to see media used on our website. Please log in or create an account then revisit this page. Please inform us of any problem that you are having by visiting our Support Form. In order to better serve our users and sponsors, access to our online materials requires registration. To learn more about registering or to get help with common questions about our site, please visit our FAQs. Most of the material made available on MetEd is free for non-commercial, educational use. We encourage you to use our material to enhance your education and training efforts. To review the legal-speak with all the nitty gritty details, see our Legal Notices page.